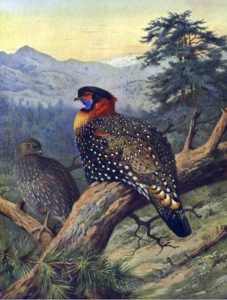 Western Horned Tragopan is a highly endangered specie of pheasant found in remote hilly terrains of Pakistan and India. No specimen of this bird is believed to be found in any zoo except for a sanctuary in Himachal Pardesh. The largest surviving number is believed to be in Pallas Valley Pakistan. Like many other species of flora and fauna, Western Horned Tragopan is effected by global warming proven beyond doubt to be caused by the burning of fossil fuel. Coexist Foundation supports programs for saving Western Horned Tragopan. To provide unified platform for healthy outdoor activities and caring for the humanity and the nature.